Yvonne Thompson is a tax partner with PwC and heads up the firm’s global aviation leasing tax network. 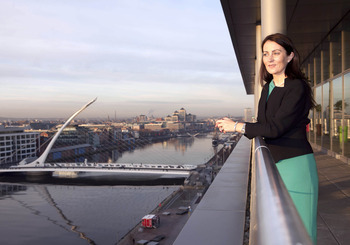 Her work involves clients in banking and insurance as well as leasing and sees her working with colleagues and clients across multiple time zones and a business trip to San Francisco presents the opportunity to market Ireland to potential clients. 5.55 a.m. I wait for the gentle sound of my alarm to signal it's time to get up and head outside into the dark and still quiet morning. 7.15 a.m. Arrive in the IFSC for breakfast with a client having listened to voicemails and scanned emails, newspaper headlines on the way in. We had a breakfast seminar the previous day for some of our clients on certain industry developments and as diaries clashed, I take the opportunity to catch up and talk through the presentations that our marketing team circulated after the event - between relaying comment from the speakers and other participants and the nuances that can just never be captured on a set of slides, we also have a chat about what is going on with them. 8.00 a.m. Back at my desk and on the phone with colleagues in PwC Sydney as we prepare for a conference call later tonight (tomorrow for them) with a client who is looking to expand outside of Australia for the first time and is considering Ireland as both a holding and operational location. 9.00 a.m. Catch-up with my PA to plan the rest of my day, respond to certain emails and arrange meetings and travel for the next few weeks. She has tremendous enthusiasm and initiative and as my role involves global and Irish responsibilities, without her, I am certain work life would not run quite as smoothly. 9.15 a.m. Part of my team join me for a call with a client in Beijing to talk about developments within one part of their business - this came up on a recent trip to China and may mean a significant change to a transaction we have all been working on for a few months - there is no direct Irish tax issue just yet but it is important for us to understand the commercials our clients face to be in a position to advise on the design and implementation of optimum structures for them and to ensure they leverage Ireland’s favourable tax and business environment. Quick call to our China desk here in Dublin to ask them to do some research for us on a particular local development that came up on the call and most definitely requires Mandarin capability! 10.15 a.m. Meeting with our head of corporate communications to walk through an article that I have promised to deliver - this will also involve a short photo shoot but not until next week so I put that part of the task out of my mind until then. 10.30 a.m. Internal training and markets session with our banking tax team. There are three corporate tax partners in our group and we take the opportunity once a month to bring our teams together to cover Irish and international developments and share knowledge of issues and experiences between the groups. Although the meeting is chaired by one of my other partners, more junior team members tend to volunteer (or be ‘volunteered’) to discuss, or present on specific topics. We also invite experts from other parts of the firm such as VAT and personal taxes, to ensure we are all aware of the latest developments that could be of relevance to our clients. In addition to our own teams, each partner tends to work with people from each of the other teams and this familiarity makes for both good banter and a productive outcome from the meeting. 11.30 a.m. Meeting with a new client of our assurance practice and one of my assurance partners. We are meeting with some of the company directors to talk about their obligations around corporate governance and risk management. While our audit colleagues spend a significant part of their time on audit work, this is an example of how their skill set goes beyond the value-added audit. For me, it is an opportunity to credentialise PwC on the tax side but in this case, the key driver for me is to support him in his role today. We debrief quickly after the meeting and agree to certain follow-up actions. Also agree to meet in a week’s time to discuss our next marketing trip to Asia. 12.30 p.m. Back to my desk to catch up with my team (who thankfully sit close to me) and then try and get through as many emails as possible - at a minimum, I try and either find a home for them or aim to respond to them myself. The inbox is starting to overflow but getting them passed along to some of my team and my PA keeps this moving. While email is superb in helping us stay connected with our clients and other teams, it does mean that immediate responses tend to be expected so trying to deal with this and manage expectations is just part of the day job. Delegation is key in our business and thankfully, I have a superb team supporting me - this means I can delegate safe in the knowledge that it will be dealt with accurately and promptly. 1.00 p.m. Working lunch with our cross line of services banking and insurance team - this includes various partners and directors from tax, audit/assurance and advisory and is a time for us to share industry developments in the main and discuss opportunities with each other. 2.00 p.m. I spend time with a number of different people in my team reviewing reports and tax returns that need to be sent out by the end of the week. In addition to helping our clients to structure their investments and transactions, a significant part of our role involves supporting them with the on-going house-keeping and day to day tax compliance that they need to deal with, across all jurisdictions, not just Ireland. This is one of the times when I have an opportunity to directly interact with the most junior members of my team. Our people are at the core of what we do and from my perspective, it is important that they understand the critical nature of this work. I am also a firm believer that this is one of the best training grounds for our people as they move up the career ladder with us. 4.00 p.m. Today has been an unusual day in that I have not left the office since morning. Working in the IFSC, a lot of my clients are local and I have a preference for getting out to meet with them in their place of work. It does take some additional time in terms of getting there and back, but the face to face interaction on-site is invaluable and I encourage all my staff to take the same approach within their roles. I arrange to meet with our business processes and technologies director and we walk out for a coffee. I want to discuss with him how best to leverage PwC’s new internal social media offering, Spark, for the benefit of the global aviation leasing tax network that I have been asked to lead within PwC. One of my tasks is to ensure all our leasing people are connected cross-border through this network. We have traditionally used meetings and conference calls as a means of linking the network, sharing expertise, ideas, knowledge but we need to move with the times and this should give us access to all of the above but on a real time basis. 5.00 p.m. Leave the office a little earlier today as I need to get home and prepare for a flight to the West Coast tomorrow morning. Taking one of my senior managers with me, we will be spending several days with clients. We will also take the opportunity to meet with some targets and do some marketing of Ireland with PwC in LA and San Francisco. In the car, quick call to a client in San Francisco to confirm dinner reservations and accept an invite to a football game. San Francisco is one of my favourite cities so travel there is always a little easier. Get the packing done quickly and sit down for a relaxing dinner and a glass of wine with my husband before we both take to the skies again tomorrow morning. The conference call with Australia was deferred at the last minute which means I will be rescheduling it from the other side of the world - it needs some people in Ireland on the call so finding a time that works across three time zones will be interesting!